This interactive video poem highlights the use of collage that is so central to Web work that one of the first Web browsers was called Mosaic. This artistic technique builds a whole out of parts, much like a Web browser assembles a coherent display document out of different kinds of electronic objects, often in different locations on a network. Formats like Flash or Quicktime produce an illusion of unity by mixing together multiple elements and packaging them for export as a single proprietary file. 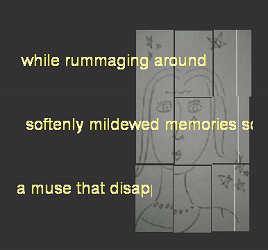 Miles shows the sutures in this 30 second looping Quicktime video by shaping the image as a roughly reassembled puzzle and by including four different sound tracks in four different locations. The music track is part of the original video, and its loudness can be controlled with the volume bar in the video window, but the voice recordings are loaded from a remote location and their loudness cannot be controlled. Since they play on an independent loop, they can be activated at any point in the 30 second video loop and continue to play uninterrupted when the video restarts. The lines of text in the video slowly float towards the left, but we can never read them completely because they restart at the end of the brief video loop, which is not enough to display the entire line. For that we need the vocal recordings, which enhance the sense that we are experiencing a work that is larger than its visual and aural dimensions. It’s a very sophisticated mollage. Featured in Poems That GO and BeeHive.